WASHINGTON, D.C. -- In the first survey after the midterm Congressional election, mentions of immigration and healthcare as the top problems facing the country are down. Sixteen percent of Americans cite immigration as the top problem, down from 21% last month, while those noting healthcare dropped to 5% from 11%. One in five Americans, 19%, now say some aspect of the federal government is the top problem facing the U.S., little changed from the 18% who said the same last month. Americans were more likely to cite the government as the most important problem facing the U.S. than any other issue. These data come from a Gallup Dec. 3-12 survey, conducted as a looming budget impasse between Republicans and Democrats threatened to shut down the government. The government has commonly been cited in recent years as the most important problem facing the country, with the problem having received or been tied for the most mentions - 22 times in the last 24 months. The current 19% who say it is the most important problem is well below the all-time high of 33% who cited the issue in October 2013, during a partial shutdown of the Federal government, but is in line with the 22% average who have noted the government this year. Sixteen percent of Americans mention immigration as the top problem facing the country. This is down five percentage points from the 21% who named the problem last month, which at the time exceeded the percentage mentioning government. The November survey had been conducted in the midst of the midterm Congressional elections, as a caravan of migrants from Central America was making its way toward the U.S. and many Republican candidates were taking a hard line on immigration. At that time, 37% of Republicans cited immigration as the country's top problem in November, up 17 percentage points from October. 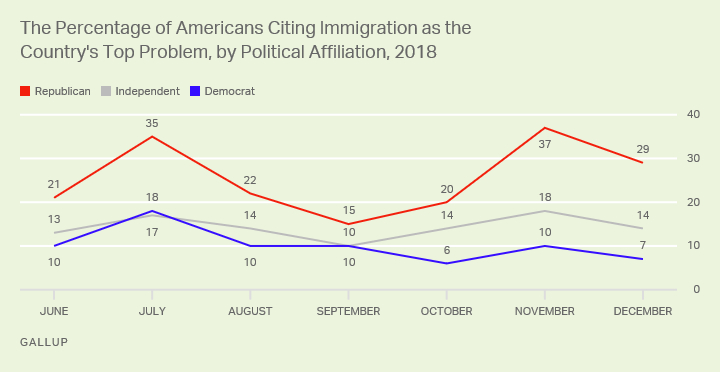 After the election, as the migrant caravan became less prominent, the percentage of Republicans citing immigration as the top problem declined to 29%, largely fueling the decline among all Americans. Potentially related to a decline in news coverage of the issue following the election, healthcare garners fewer mentions this month than in November. Five percent of Americans now cite healthcare as the country's top problem, down from 11% the prior month. During the election, Democrats, in particular, had run on the issue, contrasting their efforts to preserve the Affordable Care Act with Republicans' attempts to repeal the legislation. Declines in mentions of healthcare as the most important problem facing the country were similar among both Republicans and Democrats. Three percent of Republicans cited the issue, down from 8% last month, while 8% of Democrats cited healthcare compared to 12% in November. Among the independents the decline was more pronounced with 5% of the group now citing the issue, down from 12% last month. 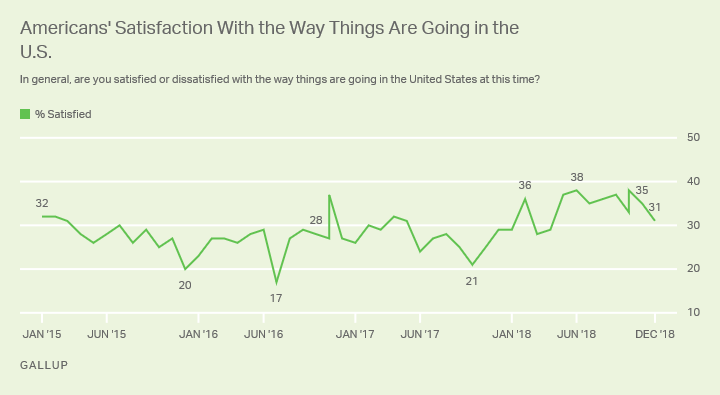 Americans also express slightly less satisfaction with the way things are going in the country than they did in November -- 31% are currently satisfied compared with 35% last month. The December estimate is also slightly lower than the average 34% satisfied throughout 2018 but remains above the average 27% from 2015 through 2017. The slight decline in satisfaction was due to modest drops among Republicans and independents. Fifty-nine percent of Republicans say they are satisfied with how things are going in the U.S., down modestly from 63% last month, while among independents, satisfaction fell slightly to 34% from 37%. Democrats' satisfaction held steady at 8%. As another potential partial shutdown of the Federal government approaches, government is again mostly likely to be cited by Americans as the most important problem facing the country. However, the current level noting government dissatisfaction is still below the 25% who cited the issue in January of this year, a few weeks prior to the last time the Federal government faced a shutdown. That shutdown ended after three days. Current public perceptions of the most important problem facing the country provide additional insight into the looming shutdown. 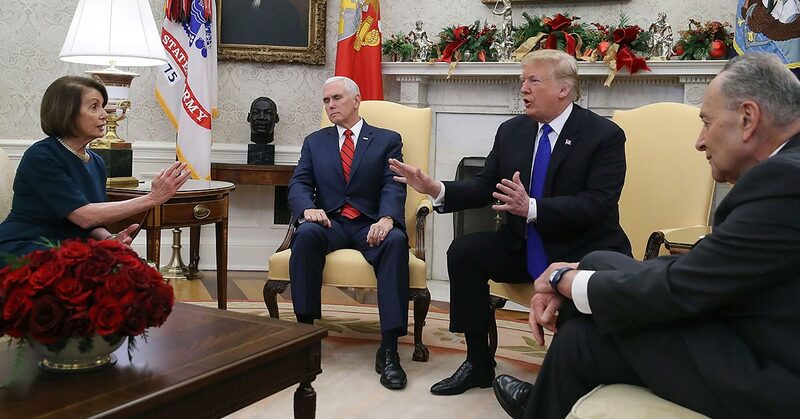 President Donald Trump has demanded that Congress fund a border wall and said he would be "proud" to shut down the government over the issue. But Trump is doing so at a time when public perceptions that immigration is the most important issue facing the country have declined. This may indicate less support among Americans for a shutdown over funding for the wall than Trump would have had last month. 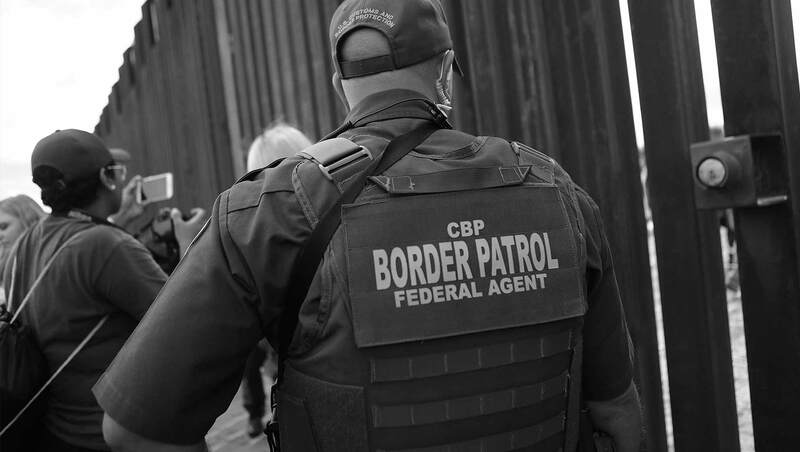 However, this month's poll ended on December 12, as a potential standoff on funding for the border wall was evolving, potentially impacting current perceptions. About six in 10 Americans say that the possibility of their health insurance plan requiring them to pay higher premiums is a major concern. Worry is even higher among lower-income adults.